WVV also lauds itself as being the first to use cork that meets the Forest Stewardship Council (FSC) standards for responsibly managed forestlands. I’ve been watching Willamette Valley Vineyards since its founding in 1983. It had the model, unique for that time, of selling shares to the public. Several friends bought in. It gave a sense of ownership. The vineyard has also been a friend to walkers, hosting many a volksmarch event over the past 25 years. But the hill it is on is a killer one for climbing back up to the finish! While WVV has some more expensive wines, we enjoy their basics for a nice quaff at a great price. The Tualatin Estate Semi-Sparkling Muscat “Frizzante” is always a crowd-pleaser. It is low alcohol and nice and sweet and fruity. We bought our first case when we went to a Thanksgiving weekend open house and were given a sample right from the vat. It was so good we wanted to drink the whole vat. We had a case of 2002 and 2004, so it was time to lay in a case of 2007. This is a wine that doesn’t need to cellar. This is the wine I serve to my walking buddies when we have a movie-watching get-together. Everybody enjoys it. For another nice wine, we enjoy their Oregon Blossom blush wine. 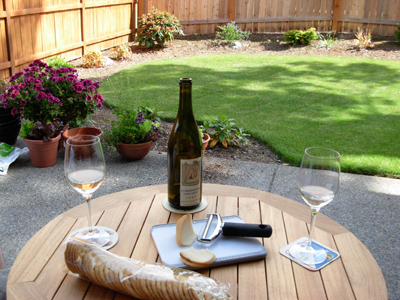 It’s perfect for a wine and cheese hour on the patio, or for serving with fish or pork. It’s fragrant, fruity, and slightly sweet. We bought a case to restock. At our July 5 party, one couple brought a wine from a winery naught but a kilometer from their house in Oregon City, Kings Raven. I opened it to allow it to breathe while we drank the other local wines I had selected: Anne Amie Pinot Noir, Rex Hill Pinot Noir, Four Graces Pinot Blanc, and August Cellars Pinot Noir. But my husband sampled it soon after it was uncorked and pronounced that the Kings Raven tasted of “smoky pickles.” I let it breathe another half hour before tasting it. Yes, the vegetable tones were there. It definitely didn’t have the cherry tones of a Dundee Hills pinot noir. Apparently, Kings Raven has an organic Marechal Foch wine. We didn’t think the pinot noir was bad, just interesting. 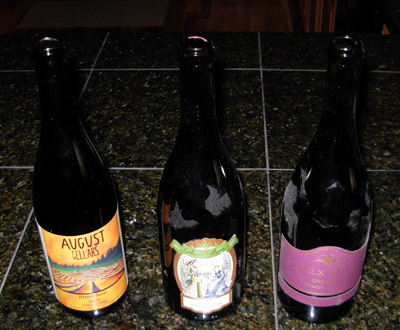 It seemed more like the earthy, vegetal California pinots I’ve tried. I far prefer the Dundee Hills pinots. Luckily – they are local! Update: The Kings Raven folks have asked that I give them another try, as they think something must have been wrong with the bottle we had. 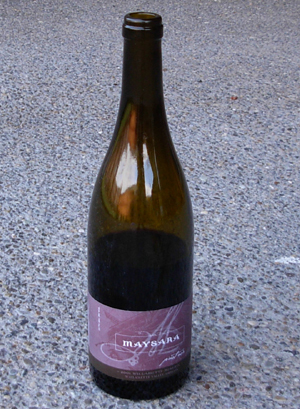 So, in November 2009 I bought another bottle of the 2006 Kings Raven Pinot Noir. The smoky pickles flavor was gone. Instead, it’s a very nice pinot noir with a pleasant flavor. Of interest is that we went wine tasting in Dundee the same weekend and found another winery who poured us a pour of pinot that tasted like dill pickles. I spent at least a half hour washing the beet greens. I saved the beet roots for roasting the next day, as I didn’t want the house to smell of beets for the party. I made my acclaimed spaetzle, boiled in the chicken broth I made from my pasture-fed chicken carcass. The party was a success, and Cathy gave me tips on deadheading my rhododendrons. I haven’t let go of my hairdresser in Tualatin since moving to Vancouver, Washington. So, I combined a trip to get my roots disguised with a stop at Whole Foods to look for Willamette Valley Cheese. We enjoyed the gouda while wine tasting in the Yamhill Valley. I saw the Smoked Farmstead Gouda paired in a display with local wine, J. Christopher, from only about 10 miles away. You can’t get much more local than that. I did not locally source the crackers. But the smoked gouda was fantastic: creamy, smoky, impossible to stop eating until the wedge was gone. I was happy I didn’t buy the $101 half wheel! The Willamette Valley Cheese Company’s web site shows its happy jersey cows grazing freely in organic green fields near Salem, Oregon. The cows are given no hormones or antibiotics. They pasteurize their own raw milk to make the cheese. The cows look as contented as my favorite Swiss cows. J. Christopher’s Cristo Misto Oregon Table Wine 2007 matched the description on its website, “aromatic quaffing wine.” It was fine for the purpose, fruity and crisp. Eating local doesn’t mean giving up the fine life of wine and cheese on the patio.